Recently my ping has been spiking a lot on Sirplease NY (from 80 to as high as 130) and I'm wondering if anyone else has experienced that. 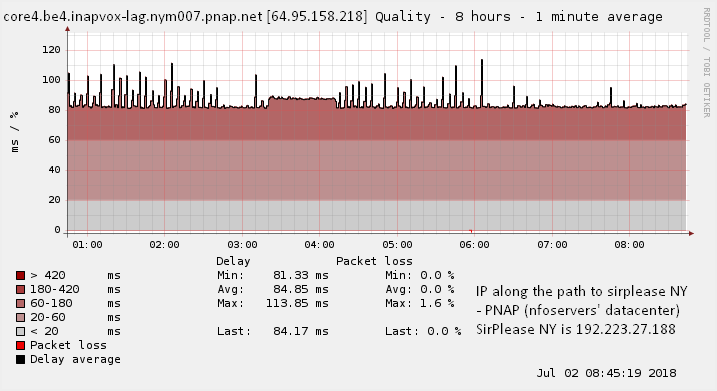 I've been able to partially track down the problem to an IP address on the PNAP side (pnap is nfoservers' datacenter). I also noticed I go through that IP due to my routing but other people won't necessarily go through that one, so not everybody will have this problem. Maybe PNAP can fix?